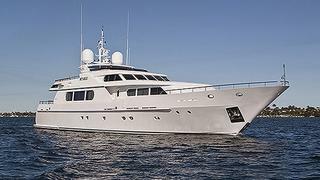 Michael White at Ocean Independence tells me that the sale of the 34.5m motor yacht My Max closed today with Peter Thompson representing the buyer and Mike the seller in his third sale of this yacht. She was built by Italy's Codecasa yard in 2000 and accommodates eight guests in a main deck master suite, VIP and two twin staterooms. This superyacht recently underwent a major refit, including a full repaint, all new audio/visual equipment, a reconfigured sundeck and new interior furnishings. My Max was asking $6.95 million.